A Wigan man slashed his partner with a pair of scissors after smashing up their flat in a jealous rage. Ryan McCormick binged on drugs and alcohol before scrawling obscene words on the walls, ripping off a toilet seat and cutting up clothes and personal items belonging to former girlfriend Kerry Monks after an encounter with her ex turned sour, borough magistrates heard. 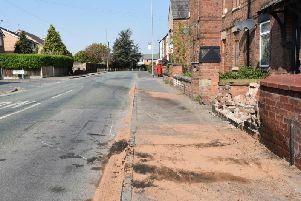 The 37-year-old was discovered by Ms Monks asleep among the wreckage at the home on Billinge Road, Pemberton. Prosecuting, Tess Kenyon said: “After waking him and telling him to get out, he was getting changed but grabbed some scissors and, swinging his arm round, sliced the victim’s finger. “She hit him on the forehead with her phone to stop him, and then rang the police as he started to stumble out of the door. “Afterwards, she had a brief look around and was left concerned by what her ex had written all over the walls, which suggested he had taken an overdose. Her tablets were strewn about the place, also. Justices heard the incident happened after the pair bumped into an ex-partner of Ms Monks - who was with his new girlfriend - and they decided to all drink and chat together for the night on January 4. McCormick disappeared home in the early hours of the morning after, but Ms Monks stayed out a while longer before returning in a taxi. A large chunk was missing from the front door when she returned, and after going inside Ms Monks noticed broken items everywhere. Defending, Mark Ferguson said: “This was an isolated incident, and one which my client bitterly regrets. He said that his partner’s ex was goading him throughout the night, and went as far as assaulting him, before he was thrown out of a club. McCormick, who has previous convictions for theft and assault - pleaded guilty to assault by beating and two counts of criminal damage. The bench sentenced him to a 12-month community order, with a requirement of 20 days’ rehabilitation activities and 180 hours’ unpaid work. McCormick was also issued a 12-month restraining order from his now ex, and ordered to pay £1,000 compensation.